The Cartography Archive contains over 200,000 documents. The rare-maps section includes over 200 maps, from 15th to 19th century. The most important hand-drawn specimen is the nautical map by Albino de Canepa (AD 1480). A large collection of Chinese and Japanese maps is particularly relevant. They are mostly hand-drawn and they prevailingly belong to the 18th century – 19 century period. 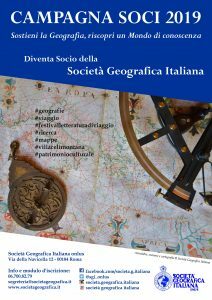 As far as modern cartography is concerned, the collection of Italian maps is particularly rich, mostly from the Istituto Geografico Militare Italiano (IGM), dating from the end of the 19th century to present day. Overall, the cartographic patrimony includes planispheres, topographic maps from all continents, nautical maps, aeronautical maps, geologic, hydrographic, climatic, gravimetric, pedologic, minerary, roadmaps, down to hortophoto-maps and remotely sensed maps. 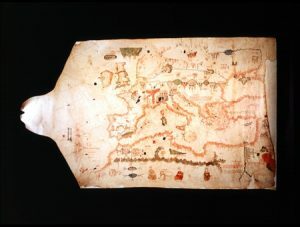 The map collections are being classified and inserted in the Servizio Bibliotecario Nazionale (SBN) environment. Maps of specific cultural interest are currently being digitized and made available through the Biblioteca Digitale Italiana (BDI) portal. It is possible to see descriptions of previously classified material from other environments (23,500 documents) and the respective digital images (ca 2000 documents) by browsing the OPAC of Cartography Archive. The Cartography Archive uses the same reading-room used by the Library. It also provides services including map search, documentation and reproduction (on paper, photography or digital support). Computer terminals are available for access to the OPAC online catalogue. The Cartography Archive is open to the public. In order to access it, it is sufficient to bring a valid ID and to fill-in a form. For a better service, it is recommended to make appointments by e.mail or by phone.